Today Malwarebytes is more then just an Anti-malware. Truly it provides you 360 degree protection. Above all it is free to scan your system for any infection. Though to get the real time protction you need to buy premium license. There is no different variation for free and paid. You can download the free version later on when you require you can use that same software as a premium after entering the premium license key. Malwarebytes acquired different security technologies and merged all of them into their single security software to make it more powerful. Apart from its malware removal & protection capability which are almost unmatched it can also be used as an Antivirus. Another good thing about Malwarebytes is that under its ‘web protection’ it immediately block the access to dangerous websites. It is also capable to handle adware. So it make the internet browsing safe. You will also get a Free 14 days premium access when you install it. After 14 days you still can use it as a on demand scanner. You can scan for the threats and even remove them with the Free version. But for real time protection and web protection you need to buy a premium key. 1. Download Malwarebytes Anti-Malware Free then double click on it to install it. Click on Install Anyway if Windows 10 asks. 2. After install, first thing is to update its threats definition database. On the right pane look for the update under System. Click on the link and it will start checking and downloading latest updates. 3. After completion of the update. Now click on the Scan Now button to start the scanning process. 4. After finishing scanning process it will show the list of infections. As we have already discussed that it comes with two variant free and paid. So lets discuss here what is the difference between Free and Premium (Paid) versions. 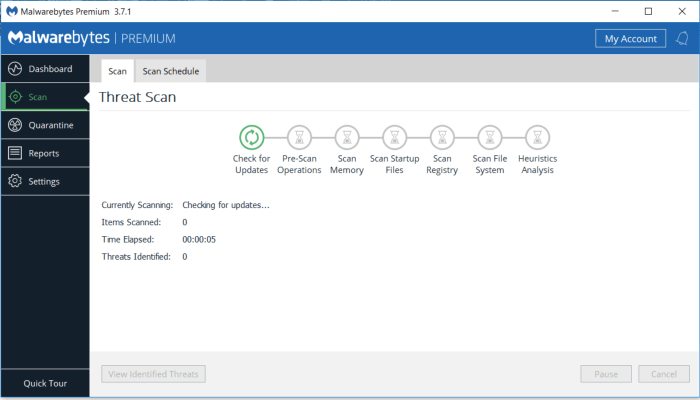 Free version is actually effective to scan the system which is already infected with the malware whereas in Paid version is stops before a malware enter into the system. 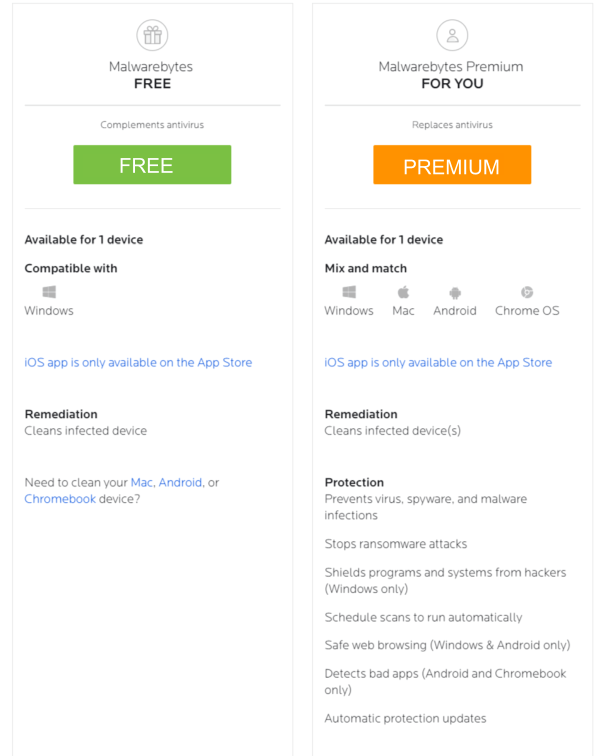 Free version does not provide web protection to block dangerous website whereas paid version does not let you open the dangerous websites which spread malware. Free version can only be used on Windows platform whereas a paid version is compatible with Mac and Android as well. Q: Does it also remove the malware in its free version? or free is just to detect? A: Yes it detect and removes malware in free version. Paid version is to catch the malware before they enter into the system. Q: Is it worth to buy a premium license? A: As per my recommendation malwarebytes is worth to buy. You can take a 14 days trial to check its usefulness and then make your decision. Q: I already have antivirus, do still I need it? A: If you already have an antivirus on your system you still can use this tool without any compatibility issue. You can keep both in your system. You can use Malwarebytes free as a second opinion on-demand scanner. Please share your experience or have any question ask in the comment section. I like the free version you can run it anytime not just for 30 days as like in hitman. Pro version is also good one and worth to buy as it gives realtime protection from malwares. Thank you it removes lots of infection which my antivirus software did not capture. And now my computer looks fine. Yes, You can, if those are not in that location “c:/windows/system32”. Good work!!! Spyware awesomehp home page was removed in IE11, FireFox and Chrome. Good job. Spyware awesomehp home page was removed from IE, FF and Chrome. 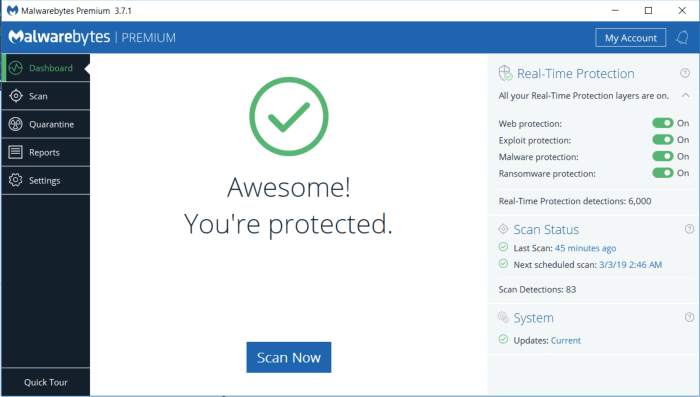 Malwarebytes is a great Free antimalware program. Use it to scan periodically for any malware on your system. Thanks for all info. Malwarebytes Pro version is good one as it keep us safe to block the malwares in real time. Because it is better to block the malware then cleaning them after infection. Great software to keep along with your Anti virus program. Thanks for the great Info guys. keep it up. Thanks a lot… malware removed. Thanks for a great piece of software. The free version is good enough to keep with your antivirus program to scan occasionally your system for any malware infection. Thank you for this great stuff. It really helps me in removing many errors in my computer. Please tell me the best discount avavailable to buy this program. Thanks a lot. I removed lots of infection from computer using this software. It is very useful and hopefully my PC will be safe from this threats in future. Thank you for this. Good explaination. Thanks for the detailed steps and explaination. it is really a wonderful piece of software. Even with your antivirus installed you must need this to protect your computer from malware. Malwarebytes is my favorite. I bought its premium version and it is giving me piece of mind.